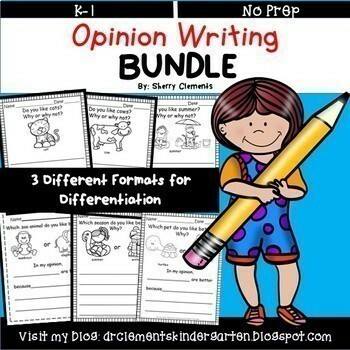 Grab this great OPINION WRITING BUNDLE HERE! Buying 19 topics in a BUNDLE offers a 12% SAVINGS! These 19 topics can be purchased individually. To see pages included, you may view each individual emergent reader product. This activity is connected to CCGPS ELACCKW1: Use a combination of drawing, dictating, and writing to compose opinion pieces in which they tell a reader the topic or the name of the book they are "writing" about and state an opinion or preference about the topic or book. These opinion writing activities are great to put in a writing center for students to choose which pictures to use to give their opinions about. Most packs include two picture choices. Each page includes two picture choices for students to choose between to tell which they think is the best. Students love telling which item they like better. This activity encourages students to give the reason why they think their choice is better. Teachers can also use these writing activities as a whole class activity. Assigning these activities for a homework assignment can include parents in helping increase their child’s writing skills. However you choose to use these activities, I hope your students develop a love for writing.